This Brown Stew Chicken recipe is AMAZING. The combination of authentic Jamaican herbs and spices as well as the Mushroom Soy and Browning Caramel, make this version of the dish unlike any other. Be careful who you invite over to sample your dish; they may never leave. Brown stew chicken is a classic Jamaican meal that delivers complex and delicious flavor for relatively little effort. It makes an excellent introduction to Jamaican cooking, and is a great recipe to start with if you haven't tried your hand at cooking Jamaican food before. Start off by squeezing lime or pouring lime juice over the chicken and rub well. Drain off excess lime juice. Combine tomato, scallion, onion, garlic, pepper, thyme, pimento, mushroom soy sauce and browning in a large bowl with the chicken pieces. Cover and marinate for at least one hour. Heat coconut oil in a dutch pot or large saucepan. Shake off the seasonings as you remove each piece of chicken from the marinade. Reserve the marinade for the sauce. Lightly brown the chicken a few pieces at a time in very hot oil. Place browned chicken pieces on a plate to rest while you brown the remaining pieces. Drain off excess oil and return the chicken to the pan. Pour the marinade over the chicken and add the carrots. Mix flour and coconut milk and add to stew, stirring constantly. Reduce heat and cook for another 20 minutes or until tender. 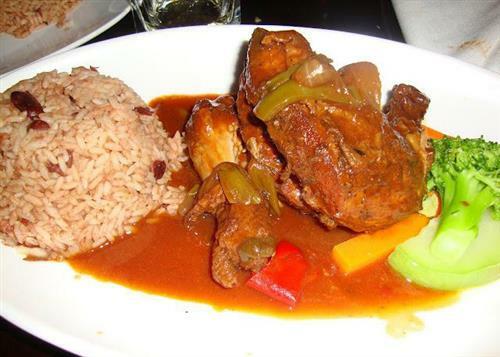 Serve your Brown Stew chicken with rice & peas or vegetables. You can serve your brown stew chicken with a variety of other delicious Jamaican dishes, including callaloo, rice and peas, veggie chunks, stew peas, or any of a variety of other delicious dishes. We encourage you to check out our other recipes and mix and match to find your favorite combinations. Be sure to follow us on twitter, and let us know how you liked the recipe! Enjoy! If you loved this recipe we'd also encourage you to check out our brown stew fish! Running into some problems, or just want more information about cooking your brown stew chicken? Read on! What's the Lime Juice For? Lime juice is acidic, so (besides tasting good) it starts to break down the proteins in the meat even before cooking, which helps to make it more tender. My Chicken is Very Dry, What's Wrong? Make sure that your pan and your oil are hot before adding the chicken. The chicken should turn brown on the surfaces touching the pan, but keep a bit of pink on the sides by the time you remove it. If the pan isn't hot enough the chicken will cook too slowly and have time to release a lot of moisture, which ruins the flavor. My Sauce is Lumpy, What Happened? Make sure you mix your flour into the cold coconut milk, and stir it for a minute or until it's smooth before adding it to the pan. If you add the flour directly, or don't stir enough, lumps of flour that come into contact with the hot liquid will congeal on the outside of the lump, basically creating a little bready flour capsule. I Always Get Burnt Residue in the Bottom of My Pan, What Gives? This is a common problem that can be avoided with temperature control, and proper hydration. If you aren't stirring your pot, make sure that the heat is on low, and that the contents of the pan is liquid enough to convect. Convection moves the liquid around in the pot for you, making it less likely to burn. As your sauce reduces, you obviously don't want to add more water, so by that point the heat needs to be set to low.